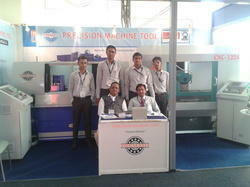 Precision Machine Tool, founded in 1992 has emerged as a leading manufacturer, exporter, importer and wholesaler of a diversified range of Grinding Machines. We are renowned for our wide range of products which include Cylindrical Grinding Machines, Bore Grinding Machine, Hydraulic Grinding Machine, Automatic Plunge Grinding Machine, Internal Grinding Machine, Hydraulic Face Grinding Machine, CNC Centerless Grinding Machine and much more. Our products are known for their excellent efficiency, high durability, easy to install and maintain. We offer quality products at very competitive prices, ensuring value for money to various esteemed clients in diversified industries. 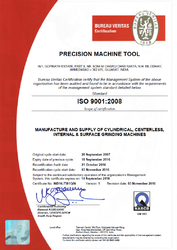 Our ethical business practices, customer satisfaction and quality products have won us accolades in Middle East, Gulf Countries, East Europe, North America, East Asia, South & Central America, South/West Europe, South East Asia, Indian Subcontinent, Australia/NZ, Caribbean, East/Middle Africa, and South/West Africa & North Africa. With state-of-the-art facilities equipped with latest machines and dedicated professionals, we are poised to deliver international standard quality products at the most affordable rates. We make sure that our offered range goes through a stringent quality check process after it is manufactured. Our adept specialist, skilled engineers, efficient workforce and matchless resources enable us to serve the demands of various sectors with quality solutions. Moreover, our easy payment modes, ethical business policies, wide distribution channel and on time delivery schedules has given us a competitive edge in the market. Our company is constantly progressing under the leadership of Mr. Natubhai Patel, who has always encouraged new ideas of manufacturing to offer a better quality of products to our clients. Being highly experienced in this domain, he is the ultimate source of inspiration for our team. We have robust infrastructure, which is equipped with advanced machines and tools. These machines and tools help us in smooth production of our products. Our manufacturing unit is backed by the latest technology to cater the demands of our esteem clients as per the international standards. Our infrastructure is perfectly divided into various units related to purposes of production, quality testing, research & development, and storage. Further, our in-house design unit, installed with advanced software, enables us to design our range in more precise manner. We have state of the art equipment for testing of products from the time of manufacture till the final delivery to the markets. Our team of diligent professionals comprises engineers, technicians, researchers, quality analysts and sales professionals. They have profound knowledge in their respective domains and they carry out the entire business operations in a swift manner. We have recruited energetic, knowledgeable and experienced professionals after the stringent selection process. Our professionals always follow set industry norms at each business step and endeavor hard to maintain a cordial business relationship with both, clients and vendors. To achieve organizational goals in predefined time, our professionals work hard to meet the client’s specific requirement in best possible way. Over the years in the industry, we have earned an enviable reputation among our clients for our quality machines. Our company takes care of the fact that all the needs of our clients’ are met within suitable timeframes. Our unique portfolio of equipment and after sales services by qualified and experienced engineers adheres to global quality standards and enables us to supply more than 1200 machines all over India and Abroad also. There is no denying the fact that we are the preferred choice by many of our clients.